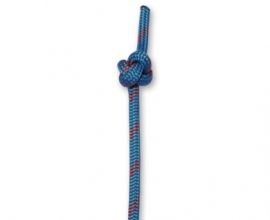 The Lanyard Knot (also known as Diamond Knot or Friendship Knot) is a decorative knot that’s used, as the name suggests, to add grip to a lanyard. 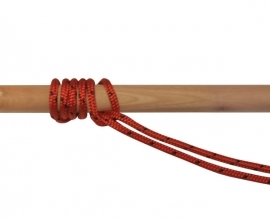 It can be tied to join two separate ropes, creating two open ends or in the two ends of the same rope, to create a loop on one side and an open end on the other. To make it easier to follow instructions, we used two separate ropes. 1. 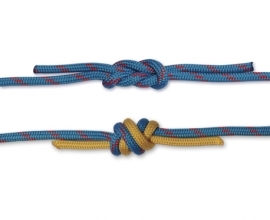 Complete the first two steps of the Carrick Bend. 2. Take the working end of line A and cross it over the standing end of line B.
Tuck the working end of line A through the center of the Carrick Bend. 3. Take the working end of line B and cross it over the standing end of line A.
Tuck the working end of line B through the center of the Carrick Bend. 4. 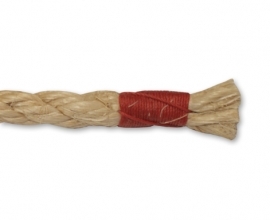 Dress the knot by pulling both ends of the knot in opposite directions.